Bedroom closet - I spent what should have been my blogging time on Tuesday hacking a path through the detritus on the floor of what is (in theory only) a walk-in closet. In the process, I discovered Christmas presents I forgot to give the kids, approximately 6,000 extra hangers, our fire-escape ladder, and various other items. And that was only 2 feet in. Children - Brian was crying this afternoon because his mittens were wet. And he didn't like his spare pair - too snug around the wrists. I adore him - he is the sweetest, most good-natured person ever. And yet I found myself grabbing the lapels (as it were) of his winter coat and saying, "I cannot knit you a new pair right now." Loudly. Poor guy. Refrigerator - worse than usual. I know! That's hard to imagine. There are all these small objects in it that persist in falling all over each other and tumbling out of the fridge whenever I try to remove a larger object. This happens about 543 times a day; and each time it occurs, it eats away another small part of my soul. Please tell me someone else has this problem. Meals - Tired of removing produce formerly known as fresh from my crisper (not!) drawers, I've been exploring the brave new world (for me) of frozen vegetables. Last week I decided to treat my family by spending Larry's hard-earned money on 2 bags of frozen broccoli with a special cheese sauce. Cheese sauce! Everything tastes good with cheese sauce on it! Heck, cardboard tastes good with cheese sauce. We all know where this is going, right? Brian spit it out on to his plate, saying "It tastes like vomit." He should know. Watching this performance, the rest of us concluded that, no matter what it tasted like, it certainly looked like vomit. So I ended up having to wash off everyone's broccoli. Because I don't have enough to do. Anyway, this generous offer has put Larry and I back onto the merry-go-round of discussing/arguing the merits of fixing our (less old) dishwasher or taking the offered one, thereby throwing out an appliance that should be perfectly good but isn't and why should we spend money fixing it but gosh it's still so new. If you couldn't follow that, you are not married. You might want to stay that way. "Oh, man, I still have to make something for dinner," I said to Larry. "Can't we do leftovers?" he asked. "All that's left over is a couple of ravioli and some egg salad. It's not enough." (Larry, looking confused) "But...the fridge is full." Sigh. All those condiments and expired foodstuffs have to go somewhere, you know. In case you were wondering? 25 dollars is all it takes to make me happy. 25 dollars - that's the cost of my new purse from Target. My old purse, you see, had become a misery, an albatross slung 'cross one shoulder, as it were. It hung too low, looked out-of-season with its summery plaid, and had handy pockets on the front that screamed utilitarian. So yesterday I took the plunge (well, what is for me a plunge, anyway) and purchased a long-coveted, faux-leather, hobo-style bag that exudes a cool, relaxed, stylish attitude. I walk around the house with it slung over my shoulder, complacent in the knowledge that my new handbag announces me to the world as a woman who knows how to accessorize. No matter that this particular purse possesses nary a cellphone pocket and is so deep that I regularly lose my wallet in it. Form has triumphed over function, dear readers; life is too short to focus on the useful at the expense of the beautiful. It's not just a purse. It's a midlife crisis in a bag. The snow has given Larry a few days off from work, allowing him time to just hang out at home and enjoy the scenery, loll around and smell the flowers, as it were. So he was enjoying the unaccustomed sight of a snow-covered landscape through our living room window the other day when he spotted something new. "Hey, kids!" he called. "Look at that bird near the feeder!" The children rushed to the window to behold a stunning feathered creature of the hawk variety. David, our resident scientist, was puzzled. 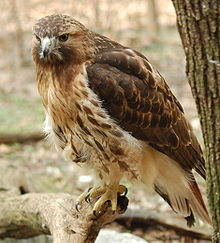 "Hawks don't eat from bird feeders, do they?" he asked. "And where are all the other birds?" What do hawks eat, indeed? Behold the food chain, kiddos, in living color! I told the younger children to find something to do (other than stand by my computer desk and shout questions at me) while I took some time to write a few bon mots. So now all three are competing to see who can best imitate the sound of a dentist drill. Hoist by my own petard, I am. Readers of this blog know that Rachel is a unique child. Not only does she possess an unusual interest in plumbing and exhibit an inordinate fondness for decapitating stuffed animals, but she also seems to have kleptomaniacal tendencies. Oh, nothing major - she hasn't taken to packing some heat and knocking off banks (yet); but we don't exactly leave money lying around the house. Once, on a trip to Target, we discovered 24 dollars in her cute little purse, 24 dollars whose provenance she claimed not to remember. So, naturally, when I discovered money while unpacking her backpack from our trip to Grandpa's house, I worried. I pictured her growing up and just "finding" things in stores and at friends' houses. I imagined phone calls to parole officers and visits from whoever is in charge of juvenile delinquents. I wondered whether she'd be able to complete college while incarcerated. I decided to have a talk with her about ownership and how you don't just claim any loose change (or bills!) lying around someone's house, even if Grandpa does think you are cute and wouldn't complain. Because, really, she's 7 already. She should know better. "Honey," I began. "I found some money in your backpack." "My money!" she said, happily. "Now, sweetie, you didn't bring any money to Grandpa's last week. This can't be yours." "No! It's mine!" Still happy. "Sweetheart, you can't just pick up someone else's money..."
"I won it!" she said, proud as punch. "From Uncle Matt! Playing Texas Hold 'Em!" That's my girl. But is gambling preferable to stealing? Or am I just rationalizing deviant behavior? And does this mean I won't have to give her an allowance? Well! I've been berated in the last post's comments for not showing up here for 6 days. I'm glad someone missed me. We had to travel for a funeral last week (my mother's, actually) and we just got back. The kids cried the whole time. For their grandmother? No. They were sobbing because we were missing a (rare) huge snowstorm back home. They spent all of Saturday watching the Weather Channel. They cheered up considerably, however, when they realized the TV room contained a motorized recliner, something Grandma sorely needed in her last days. They were delighted that, at the push of a button, the chair would go slo-o-owly up and forward; another button, it would go slo-o-owly back down. They took turns. They were amused for far longer than the 15 minutes or so normal children would enjoy such a contraption. And the next morning? As soon as I came downstairs, Rachel came running over to me. "Mommy!" she begged. "Can we play in the electric chair?" Hey, CBS? Do The Right Thing! I have found an excellent article about the Super Bowl ad featuring Tebow. Written by an ardently pro-choice woman, it lists the reasons that Tebow's pro-life ad should be aired by CBS on Super Bowl Sunday. Well, I think it's excellent - some of you may hate it. If the pro-choice stance is so precarious that a story about someone who chose to carry a risky pregnancy to term undermines it, then CBS is not the problem. How dare she muddy this controversy with logic? The nerve of that gal! control freak, wanting to see Grease, needing payment, etc.